Take Your Furniture Home Today. It’s as Easy as 1-2-3! 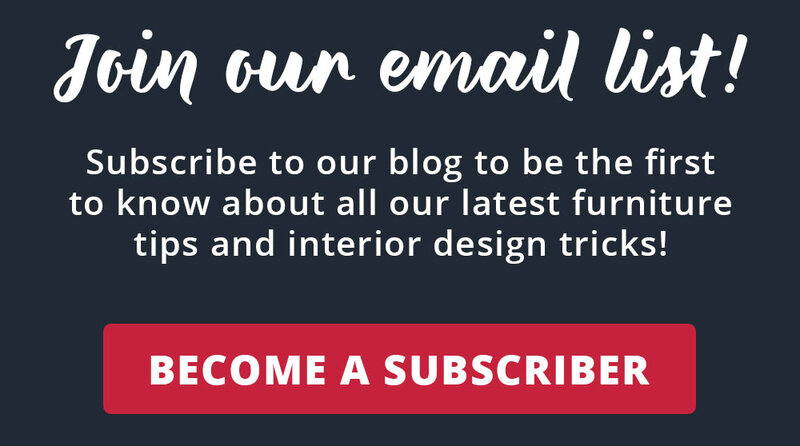 At American Freight, we pride ourselves on making quality furniture and mattresses available to everyone, on any budget. And even though most of us prefer to plan ahead, sometimes you need to take your furniture home today when you least expect it. Maybe your living situation has changed suddenly, or maybe you were affected by one of the many recent hurricanes or other natural disasters that impacted so many Americans the past few years. Or maybe it’s just that your old furniture is on its last leg- literally! We offer instant approvals on payment plans! No credit? No problem. Streamline your application process by applying ahead of time in the comfort of your home. Then, bring in any approval paperwork and questions to your local American Freight store. Our employees are happy to help answer any questions you have! Text “YES” to 41806 to apply right now, or click here to go to the application for more information and further details. If you want an alternative to the no credit payment plan route, consider our free layaway program. Layaway is a system of paying a deposit to secure an item for later purchase. The day you set up your layaway plan, it guarantees the price and locks you in. 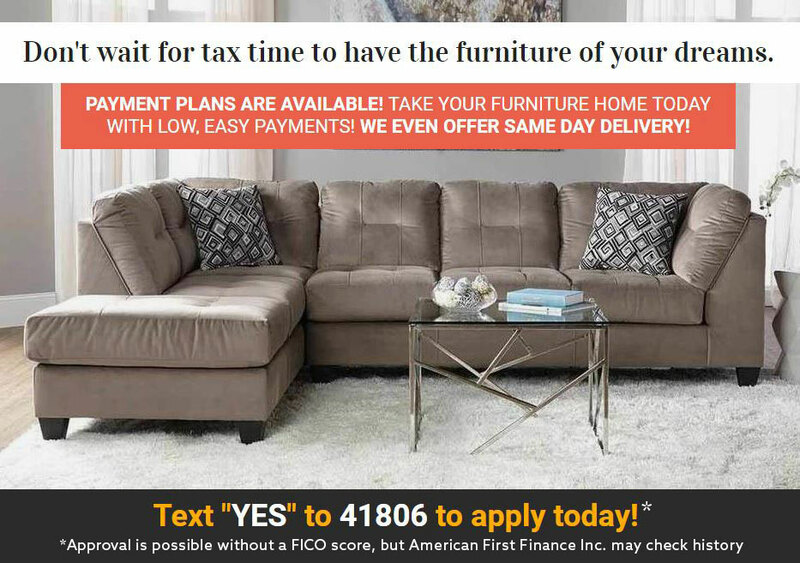 So, while this may not get your furniture home today-today, you can start a plan today to get your furniture home very soon, at no interest. For more details on our layaway program, please stop by a local store, or read more in our terms & conditions here. Last but not least, take your furniture home today the old fashioned way: by cash or charge! American Freight stores accept all major credit cards including Visa, MasterCard, Discover, and American Express. Pay in full, and take your in-stock items home immediately. If you need help getting your furniture and mattresses home, we offer same-day delivery on all in-stock items through a contracted third-party service. Find your local store here and stop by today, or check out all our current promotions on our website. Check out this cheap sofa and loveseat deal on motion furniture and save hundreds! Please check out our “Living Rooms” page for pricing, or stop by your local store for details on what’s in stock. Thank you. Do they assemble furniture ? Some delivery teams will assemble for an additional charge. Please check with your local store for delivery details. Click here to find your local store. Thank you! Do you offer store credit cards and the store in vestal do they deliver to Elmira ny? That’s correct. You are able to apply from your phone/computer in the comfort of your home to instantly determine if you are approved or not. If you are approved, you will also learn your limit and the terms of the offer. Then, if you want to take the offer, you can bring it to your local American Freight store and start shopping. For further details and a link to apply, please click here. Please call the Glendale store at 602-993-8877 for delivery information and specifics. The $50 fee is state dependent, and is only applied if you accept the approval. I received a text message after applying online, stating that I was approved for 0.00 but an initial payment maybe needed. Can you let me know what I need to do? On the payment plan, is it like a rent to own place where you actually pay twice as much? You can learn more about American First Finance’s offerings here. Do you get your $50 app fee back if you’re not approved? The $50 fee is state dependent, and is only applied if you are approved and accept the approval. Will this application be a hard inquiries on my credit. If I get approve what documents I have to bring in? When applying for credit, is it a hard pull that decreases my credit score? If not, how is the qualifying amount determined? Can items on sale be or clearance be financed?Specifically the 8 piece bedroom for $398.00? Is the $50 fee charged in NYS? When completing the application would this be a hard pull on my credit? Do you all check the credit and show up as an inquiry on my credit? I applied for your credit but was denied….I do, however, have paypal credit, do you accept paypal credit as payment? I don’t mean the credit card,and if so, how do I go about using it to make purchase at the store. Thank you. I took a look at the application and the section where you enter your debit card/banking information surprised me. Why do you need that information to be approved? Hello! What it’s the interest rate? Is there a possibility that you wont get approved? And what would be some reasons why? Because they always say its no credit, but it really is. For the best answer, you can contact American First Finance and ask all your questions. They would be be best as they are the team that allows us to use payment plans! what are the guide lines to a pre-approval? Is it credit based or income based? What are the terms 12 month, 24 month and so on? What interest rate will be applied? If approved we can’t purchase online? Unfortunately we do not have an e-commerce store set up just yet. In-store is the way to buy! How far do you all delivers is it a certain amount of distance you all will travel or no? Hi Lisa, Yes that is correct. The $50 application fee is only applied if you make a purchase and decide to use our payment plan options. The package with 18 pieces, is it certain pieces? Do you guys charge for delivery? Hi Wendy! We do have delivery. We use subcontractors and delivery is due in cash upon delivery. do they make HARD inquiries when checking you credit? What do the payments look like if I charge about 1500.
can you use a prepaid bank account ? How much about is payments? Do you tell us how much is too be paid monthly or do I pay what I can afford? Why does it say no credit check but isn’t really a credit check? My question is; if you choose to use the finance option, do you have to purchase just a living room suite or just a bedroom suite or can you purchase furniture for the whole house and make monthly payments?? Me and my mother-in-law to be was in your store earlier today and the guy working was very rude to us and just walked away when I tried to ask questions. First time ever being in there and most likely the last time. This was at your store next to Gabes. For the $50 fee, it was stated that it is state dependent, is that charged in Texas? Also, it states that it is EITHER a application fee or towards your purchase. How is that determined? Hi there! Thank you for your comment. Check out this link for more information about payment plans through American First Finance: https://social.americanfreight.com/nocredit/ Texas falls under the “Lease to Own States” section. i just purchased a love seat recliner that i am still paying on and already , having problems with one side caving in. and i have no little ones and i don’t sit on it enough for it to be taring up. what can you all do about it. i am still paying on it. Hi, Margaret! Thank you for your comment. Unfortunately, we do not have an e-commerce website just yet. However, a brand-new American Freight location is coming soon to Dothan, Alabama! Keep an eye out for grand opening information in the weeks to come! Am I ONLY paying $398 for 7pc furniture? Hi, Jamie! Thanks for your comment. Yes! We offer a 7 piece living room package starting from just $398. You can customize it to fit your needs. Check out the details here: https://shop.americanfreight.com/all-packages/ Happy shopping! My comments: 1st, it would help a lot of people from wasting their time if it said ” We Do Credit Check”. 2nd, the interests is extremely high and the payment plans are very high. 3rd, with the example given for the finance rate, its 2 1/2 times + being paid. Now My Question: There were a few other company options on THIS site other than AFF, that people could apply through to get approved. Are those still an option?